Enhance your vehicle with mobile video, one of the hottest trends in car electronics today! Whether you’re looking to entertain the kids during long road trips or impress business colleagues, Mega Watt Car Stereo and Security has the car DVD system you’re want. And, since we provide both sales and MECP certified installation, we’re the ideal choice for convenient one-stop shopping. Just imagine how smoothly car trips will go when the kids can watch movies in the backseat! When you want to upgrade your car audio system to include video, you need to visit our Marlboro showroom to demo in car DVD players, check out our selection of video screens, and talk to our mobile video experts about the right system for your needs. Today’s technology means the sky is practically the limit when it comes to car video. 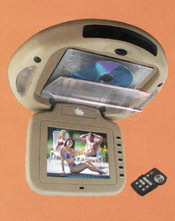 There are numerous options in screens, car DVD players, headphones, and more. Mega Watt Car Stereo and Security offers a wide selection of mobile video components to help customize your system to suit your needs, vehicle, and personality. Available screens include ceiling mounted (flip-down), headrest mounted, visor mounted, and in dash. You can opt for an integrated CD/DVD/radio deck or add on a stand-alone DVD player. And, while many people are familiar with today’s in car DVD player technology, most don’t realize you can also get systems that incorporate TV tuners and iPod video integration! Other available features of your car video system include remote controllers, video game inputs, and infrared headphones. At Mega Watt Car Stereo and Security, we offer custom installation on all of our car video systems. We offer custom upholstery, dashes, and fiberglass to ensure that your car DVD players and screens look their absolute best. Our MECP certified installers provide quality installation with beautiful results! We can go for an OEM, factory look or a showpiece installation, depending on your preference. Mega Watt Car Stereo and Security also offers backup cameras with in dash screens; this safety feature enables you to see behind you, no matter how big your truck or SUV. Back up cameras are great if you have small children or pets!